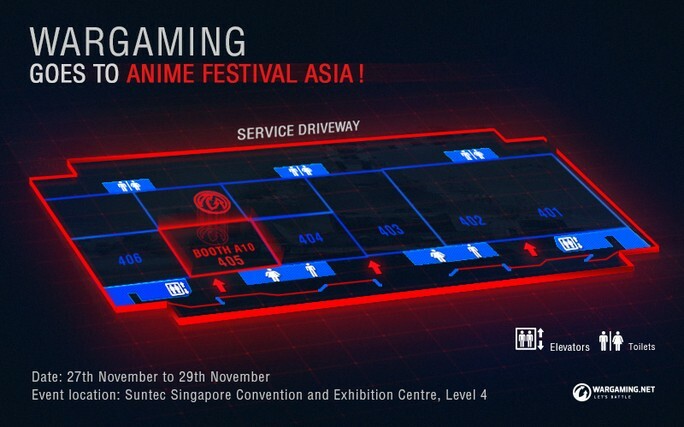 Wargaming Goes To Anime Festival Asia! If you're a fan of Japanese popular culture, chances are that you're heading down to Anime Festival Asia (AFA) Singapore 2015, which takes places from 27th to 29th November at the Suntec Singapore Convention and Exhibition Centre. Wargaming will be there too, and we'll be showcasing some special content of ours, inspired by Japanese popular culture! If you're heading to AFA SG 2015, come to our booth and participate in our booth activities to receive premium goodies! If you're thinking of trying our games out, we'll be giving out special World of Tanks sign up bonuses at the event, as well. On top of these sign up bonuses, you can get some of these cool badges! If you need tickets and haven't bought them yet, fret not. Take part in our Facebook contest and you could win tickets to AFA! In addition to our Facebook contest, we'll also be holding a lucky draw: one lucky winner will walk away with a pair of Anisong concert tickets for Day 3 of AFA 2015, featuring live performances by popular artistes such as nano (ナノ). Her voice powered the vocals for Saviour of Song and Silver Sky. These songs are the theme song for Arpeggio of Blue Steel: Ars Nova and its B-side, respectively. It will be a performance not to be missed! Other performers for the evening include: GARNiDELiA, Lia, May’n, Mika Kobayashi feat. Tetsuro Shimaguchi. As you can see, our booth will be a short walk from the entrance of Hall 405, on level 4 of the Suntec Singapore Exhbition and Convention Centre. Come take a look at our exhibition! We look forward to seeing you at AFA 2015!